Every Dollar Makes a Difference Whether we’ve faced it ourselves, or someone we love has, almost everyone has been affected by breast cancer in some way. But at the same time, we can all do something about it. 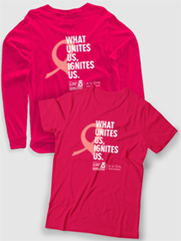 By donating to a Making Strides Against Breast Cancer event you’re helping the American Cancer Society make a difference in so many ways, from funding innovative breast cancer research to simply providing a hand to hold. At Making Strides events around the country, people are coming together to celebrate survivors, have fun, and raise money and awareness for the American Cancer Society’s efforts to save lives from breast cancer. Check out the amazing and inspiring photos. It's almost time to walk together and make a bigger impact on breast cancer. Join us and see the power of being YOUnited™.